Her Centre has provided domestic and sexual violence awareness training to professionals and the public for the past 7 years. Trainings are conducted in Woolwich; however it is also possible for the training to be conducted at a venue of your choice. We run a combination of free and paid-for trainings. 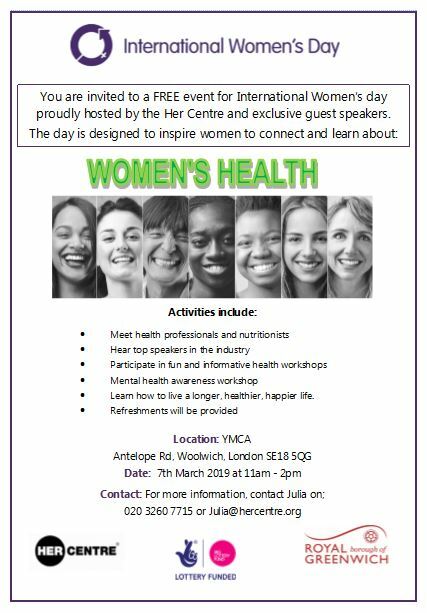 Please contact us for further information on 020 3260 7715 or email info@hercentre.org. About Maternity Rights of Working Women on 25th June 2019 at YMCA, SE18 5QG. For more information contact Julia on 020 3260 7715 or 07976 128063. See leaflet . 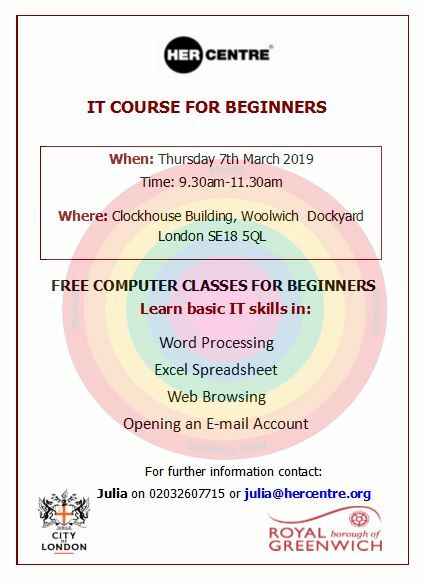 IT Course for the Beginners: Learn basic IT skills in Word Processing, Excel Spreadsheet, Web Browsing and how to open an E-mail Account. For further information call Julia, on 020 32607715. 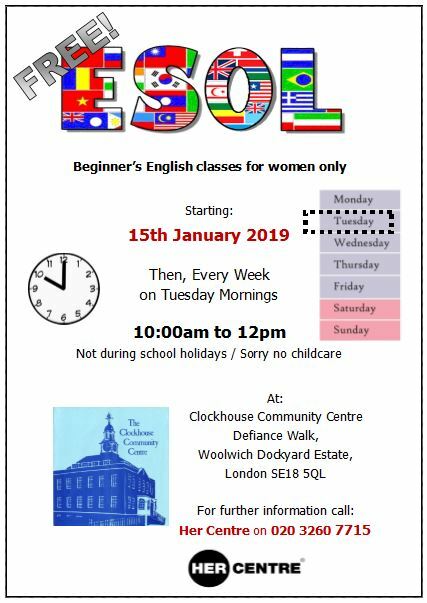 Starts on March 7th 2019 at Clockhouse Community Centre - 9.30am to 11.30am. 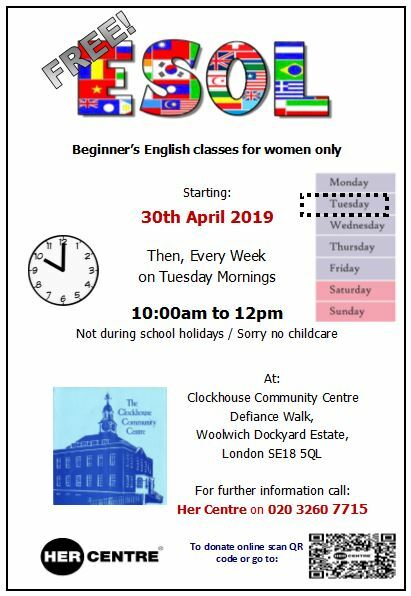 ESOL: April 30th 2019 (At Clockhouse Community Centre) - 10am to 12pm, every week on Tuesdays. No classes during School Holidays. For further information call us on 020 32607772. 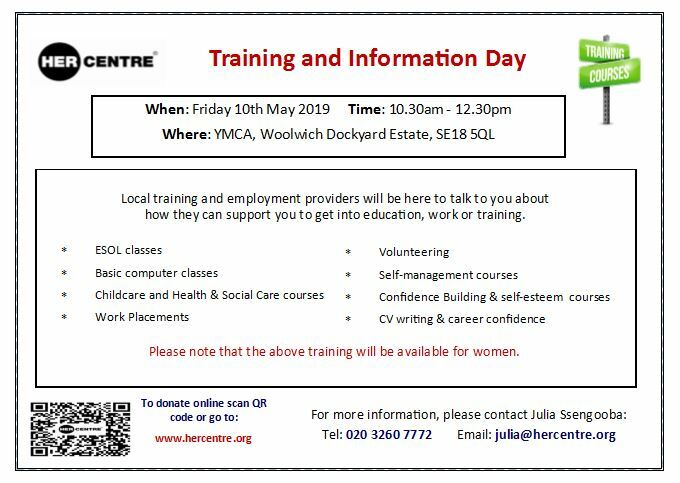 Training: Training & Information Day on 10th May 2019 at YMCA, SE18 5QG. For more information contact Julia on 020 3260 7772 or 07976 128063. 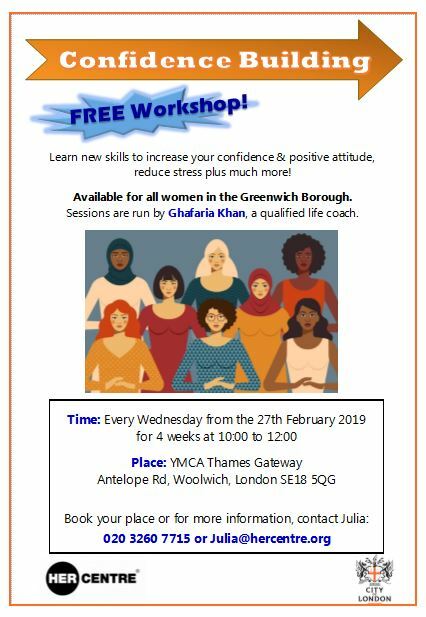 Confidence Building: Available for all women in the Greenwich Borough. Every Wednesday from the 27th February 2019 for 4 Weeks at YMCA, SE18 5QG. See leaflet . Butterfly Programme – Domestic Abuse Awareness for Victims - this is a programme of 10 sessions for women who want to learn and understand about the nature of domestic abuse. The programme helps women to come to terms with the effects of domestic abuse and to recognise signs of abuse in subsequent relationships. The programme covers parenting aspects and supporting those whose children have lived with domestic abuse. Open to women who are funded by Children’s Service, Police or Children's Centres. Her Centre Parenting Programme – Women only - this course supports women to gain and develop a better understanding of parenting. The 10 week course helps mothers/carers to create positive relationships with children, and to address challenging behaviours. The course is based on the Mental Health Trust Non-Violent Resistance model and allows mothers/carers to share their experiences and concerns in a supportive environment. As the local Independent Domestic and Sexual Advocacy Service In Greenwich, Her Centre provides a range of training courses for professionals, at very reasonable cost. Two of our courses are provided free of charge to locally based public and voluntary sector agencies. Information on the range of courses is below.